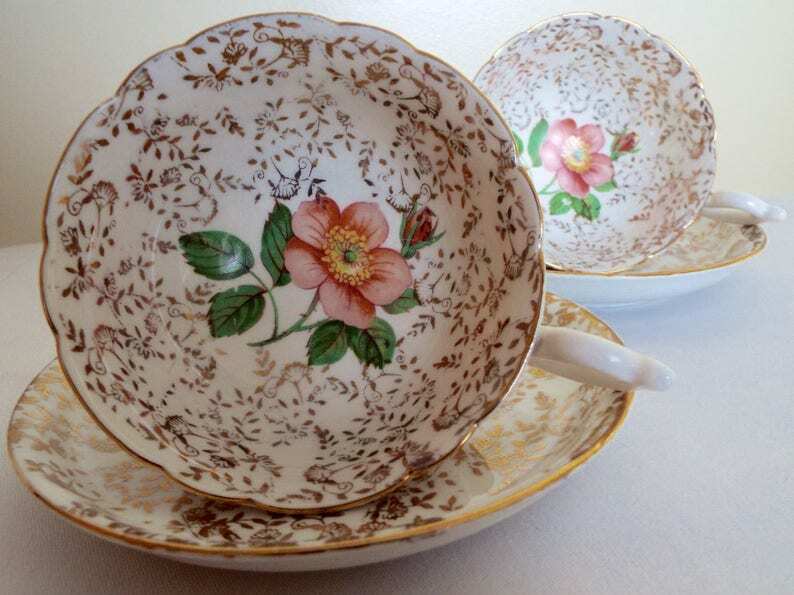 Made in England in around the 1950s, this vintage teacup and saucer is just beautiful. The gold floral pattern covers both the teacup, inside and out, and the saucer. It is so elegant and eye catching! Then, making this teacup extra special, a very pretty wild pink rose is found at the bottom of the inside of the teacup. This would be a lovely surprise for a friend or guest at teatime, once they have drunk their tea! The dainty open bowl shape of the teacup, with its elegant footed base, along with deep saucer, makes this set extra special and beautiful. The teacup handle is a very dainty shape too. A truly beautiful teacup and saucer, it is dainty and elegant and would make such a wonderful gift. The luxurious amounts of gold are especially beautiful and the pink of the rose looks beautiful against the gold decoration and white china. It would display beautifully and catch your eye from across the room. If both sets were purchased together, they would display wonderfully as a matching pair. This little tea set would make a perfect gift to someone special, perhaps to someone who loves tea and vintage, or as a birthday or anniversary gift. It would make a wonderful Christmas gift. In very good vintage condition, with no chips, cracks or crazing to the glaze. There is some slight wear to the gilding/gold decoration in places, as is to be expected given this teacup's age and use. There is some minor wear to the rose image in places, as can be seen in the petal of the rose in photo 7 of the remaining teacup I have available, but this is minor and to be expected. It does not spoil it in any way. The underside of the saucer has some tiny scatterings of gold paint, as seen in example in photo 9, which are just a result of the manufacturing process. Any further wear there may be is commensurate with age and any minor blemishes are part of the manufacturing process and part of the piece's character. Your teacup will arrive carefully packaged and beautifully wrapped in vintage style brown paper and ribbon, at no extra charge. Please see my other listings for examples of my packaging.